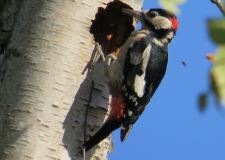 The purpose of the woodpecker-network website is to encourage and facilitate the study of woodpeckers in Britain and Ireland and to provide a forum to share techniques, results and good practice. In due course, it is planned to provide material on all woodpecker species found in Britain and Ireland but initially we will focus on the Lesser Spotted Woodpecker Dryobates minor, a species which is in strong decline. We offer support to volunteer birdwatchers nationally to find and monitor nests and to pool the results. We aim to promote the cause of Lesser Spots and encourage systematic recording of breeding attempts. Our report on the 2018 breeding season with details of all the Lesser Spot nests monitored and analysis of the results was published in October 2018 . 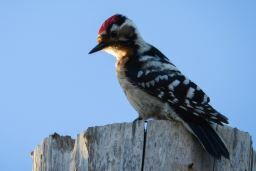 This web site has been created by Ken and Linda Smith who have been studying woodpeckers for more than 30 years. 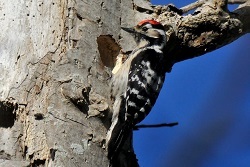 A few years ago, we realised that the opportunity was being missed to collect important breeding data from Lesser Spotted Woodpecker nests found as part of normal birdwatching – either because the observers were unaware of the potential value of their observations or because the means to inspect the nest contents was not easily available. 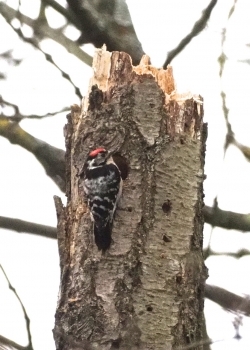 So in 2015 we launched an initiative to help and encourage observers to find breeding Lesser Spotted Woodpeckers, where possible find the nests and to facilitate the recording of their contents and outcomes. Full details are are on the Lesser Spot page. We had a good response and thanks to the efforts by volunteers ten nests were found and recorded in both 2015 and 2016 from as far afield as Shropshire, Lincolnshire, Devon and East Sussex. This was a big increase on the one or two reported in the previous years. In 2017, 20 nest sites were found and monitored through the Network. The project to find and monitor nests continued in 2018 - see our October 2018 report on the news page. As most birdwatchers know, the Lesser Spotted Woodpecker is in serious decline in much of its British range (see the BTO website for full details of population trends and other monitoring). The reasons for the decline are not known for sure but work by the RSPB between 2005 and 2009 suggested low breeding success was a possible factor (for a review see Smith et al. 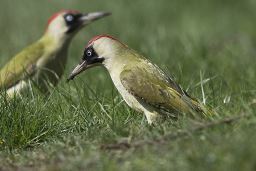 2012, British Birds 105, 294-307) link to BB paper. It would be great to be able to compare the results of the RSPB work with those from the BTO Nest Record Scheme to see whether low breeding success is a general problem. Sadly, over the last few years the numbers of nest records for this species have fallen to such low numbers that this is not possible. 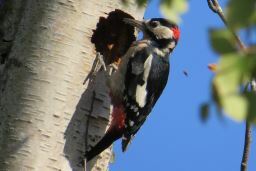 The primary purpose of this website is to provide support for birdwatchers to find Lesser Spotted Woodpeckers and where possible find nests and provide the means to record breeding success to help in the conservation of this species. All data on breeding sites and nests will be treated in strict confidence.